It's my first time to meet him and my first time to talk to him. I was excited though when I read his credentials, because my face lit up when I learned this humble guy is from the same school as I am. He's a late bloomer, he started to write songs a couple of years ago but he didn't get to play music during college days because he was barred from doing so by his girlfriend (which he followed strictly). He started playing in small clubs, restaurants as an acoustic singer (he applied for it when he saw an ad on a newspaper) and got it right there. A friend has been listening to his soundcloud recordings and asked him if he could give it to a couple of people. It landed on GMA Records table and suddenly, Kian Dionisio already talked about recording for the label. But they took their time instead of just doing his existing ones. I must say when I heard him sing, I already knew why GMA Records signed him up. He's freaking good! He also started to tell us about how he started, and a couple of things about the album. Listen in. 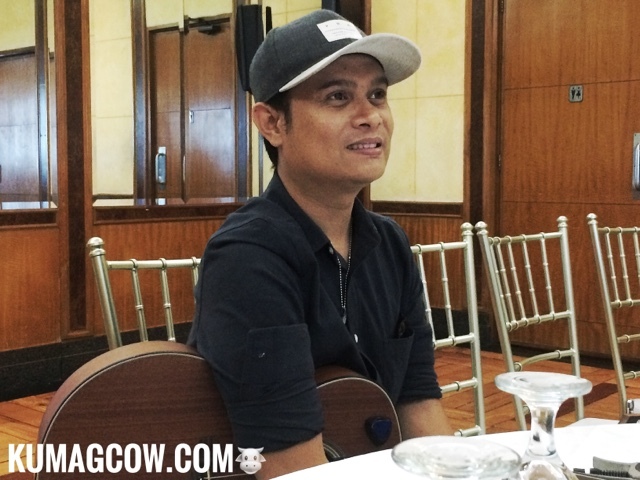 He's optimistic, hungry for a challenge to step up the plate and be much like his idols Johnoy Danao, Ebe Dancel, Noel Cabangon and the other great musicians, artists and composers. I have very high hopes for this guy who also hails from University of the East Caloocan, and although he's not fully doing his Communication Arts degree, he's a great singer, a diamond in the rough that is worthy to get discovered. He's currently opening for current GMA Records artists like James Wright and will also be doing the rounds in mall shows plus the Sunday afternoon show on the same network. He also has the album released digitally as an EP available in all Digital Stores including iTunes worldwide! Make sure you check out his music. Pretty good I tell you! Pretty good!